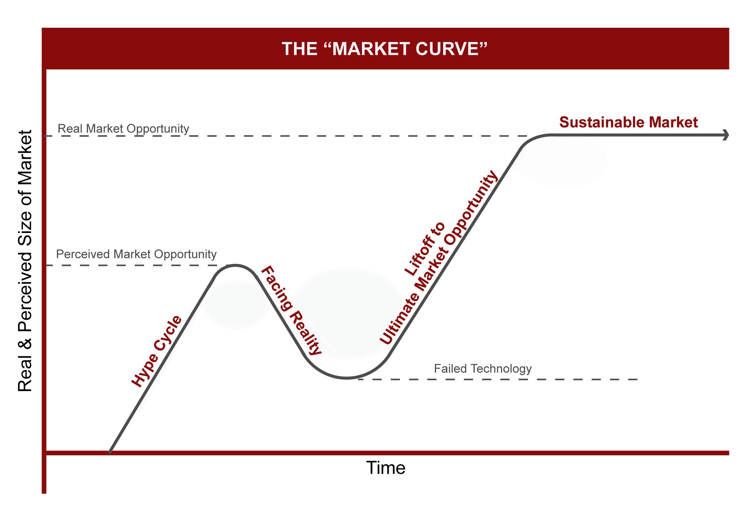 Below is a link to my post in Techcrunch about "The Market Curve": a theory about the life cycle of Markets. First, a period of overheated expectations (the "Hype Cycle") followed by an extended trough (called "Facing Reality") when the market is not able to deliver. Ultimately, when the core technologies, the right products and the leading companies are in place, strong technology markets become much larger than contemplated even during the Hype Cycle (called "Liftoff"). 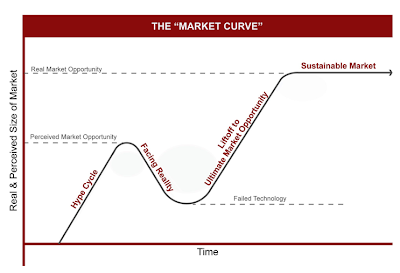 In this first post, I describe the concept of the Market Curve and how the Internet, Mobile and Cloud markets have navigated the Curve. A key takeaway is that the best entrepreneurs and investors have conviction, even during market troughs, and take advantage of that time to build and invest in leading companies whose technologies and products are what take markets to their ultimate potential. Trough-breaking examples referenced in this post include: Internet (Amazon.com & Youtube), Mobile (Apple), Cloud (Salesforce.com & Successfactors). In my next post (next Sunday in Techcrunch), I will give my perspective on where newer markets like Proximity Mobile Apps, Daily Deals and others are on the Curve. Thanks Techcrunch for running these posts! It is nice to read the information provided and such blogs help to students to find the proper way for their carrier and it is better approach to carry on the education. I will give my perspective on where newer markets like Proximity Mobile Apps, Daily Deals and others are on the Curve. Where in the cycle would you say Corporate Wellness technology is then? I really enjoyed your whole experience with your photograph. Your creative use of lighting is amazing. It's simple but it most closely reflects the experience of mother. Thanks.. The second interesting element is to reflect on the state of actual Indigenous-colonizer relations, and the state of Indigenous resistance to the colonizing project. Your blog dress is very beautiful, I really like your style, content layout is also very clear. Always imagine you as good a design space. I would like to learn from you. Thanks for sharing such a use full information.I will check your Blog for further information. I really liked your post. I must say you are very incredible author. Thanks for sharing. When you're doing something, do at your best. Every success is achieve through hard-work. Thank you for the post. Through reading this, I do know now the theory about the life cycle of Markets. Thanks for the educational post you have shared with us. It proved to be very useful blog. Thanks for sharing, The information that you have provided is very helpful.I really enjoy simply reading all of your weblogs. Simply wanted to inform you that you have people like me who appreciate your work definitely a great post.Hats off to you! Once we have got earlier mentioned, sparkle large amount of tries to result in loud snoring. Nevertheless, almost certainly the best possible could be the surgical treatment where long-lasting remedy techniques are often utilized. A higher degree patient returning by means of loud snoring, thrilling you will get before stop snoring examination. While it won't be described as any kind of existence-threatening circumstance, will still be most likely the situation could possibly get extreme. "While clients may already visit a few in the new packaging in shops, calling their smokes by their old names might be a harder habit to eliminate than smoking itself. "I'll request Newport Light 100s, and I'll let them decipher it," pointed out 52-year-old Joe McKenna, an instructor and longtime smoker from Jewel River, N.Y., whose brand produced by Lorillard Corporation. has become electronic cigarette recognized to as Newport Menthol Gold. "It is simply type of absurd meaning you understand they are dangerous to meet your requirements.In . Nothing does not include a small portion of a fire prevention installation of these devices. For a variety of devices is installed, it does not guarantee protection at all. Testing and maintenance of equipment is an important stage of prevention too. Step into any art studio and watch as art classes for kids bring children to life. As each child expresses themselves through art and poetry they become transformed into confident leaders who believe in their ability to create important and relevant creative artwork. Definitely agree with what you explained. Your explanation was certainly the easiest to understand. babydoll ungu Tell you something, I generally get irked when folks discuss issues which they plainly don't know about. bodystocking hitam You managed to hit the nail correct about the head and explained out everything without complication. bra gstring set This awesome blog is no doubt entertaining and also diverting. kostum lingerie maid I have found a lot of interesting advices out of this amazing blog. I’d love to visit it again and again. jual lingerie biru Cheers! The communications infrastructure of the Internet consists of its hardware components and a system of software layers that control various aspects of the architecture. lingerie bra gstring While the hardware can often be used to support other software systems, it is the design and the rigorous standardization process of the software architecture that characterizes the bra miniskirt and provides the foundation for its scalability and success. lingerie cantik Thank you. The market status keeps on surprising us. Incredibly a great page in here indeed. บาคาร่าออนไลน์ Amazing Website, Thank You! Keep up the great work. Hello! I just would like to give a huge thumbs up for the great info you have here on this post. An interesting discussion is worth comment. Your site is very good to see most examples. Thanks for referring to your web page.This weblogs are very useful. I really say thanks to you. I am truly liking perusing your well composed articles. I suppose you invest various exertion and time overhauling your website. I have bookmarked it and I am investigating to perusing new articles. Kindly keep up the exceptional articles! I like to see this types of post where people sharing some unknown information.